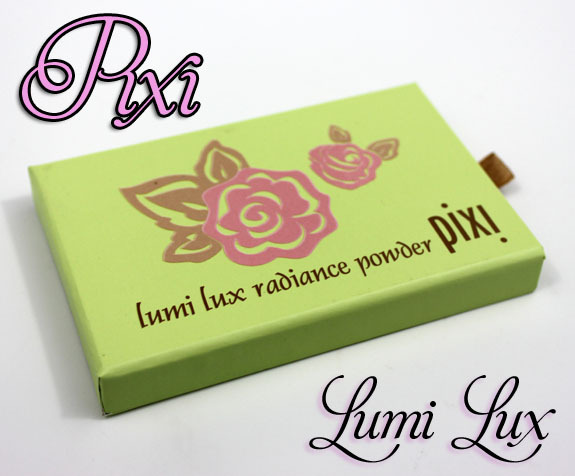 Pixi Lumi Lux Radiance Powder is new for spring 2011, and in such cute packaging! Lumi Lux is an illuminating powder which can be used on the face and decolletage to help brighten up and make your skin radiate. It comes in a slide-out container, which I really like. 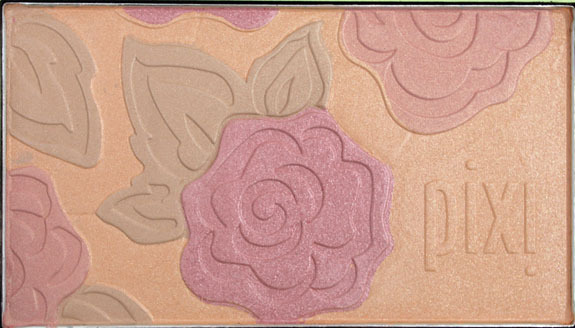 The powder itself is a really nice design, with flowers and petals in rose, gold and light pink and a background of shimmery peach. 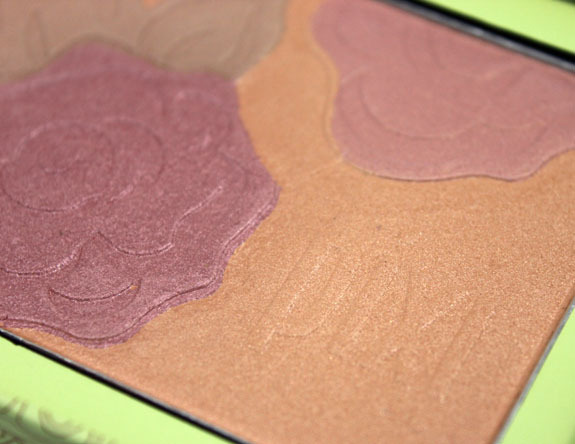 The texture is soft and it’s fairly easy to pick up the color from the palette onto a brush. As you can see the colors (which are all blended here) don’t give you a ton of color, more of a subtle peach/gold glow. This isn’t really a palette you could use as a blush or eyeshadow since the color is SO subtle, but it does make a good all-over highlighting powder for the face. I love the packaging and the look of it, but the effect is pretty subtle. I do wish it was a little less expensive since it’s sold at Target. What do you think of Lumi Lux? 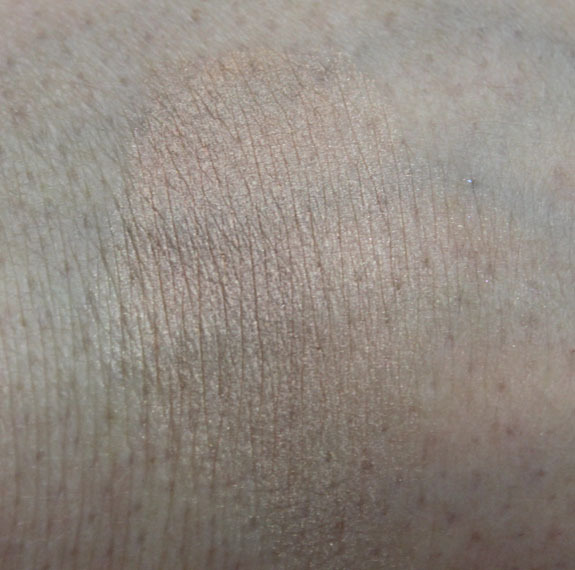 This doesn’t look like it has the pigmentation I’d want. At first, I thought it was a bar of chocolate with that cute packaging. Very nice subtle glow. I’ll put it on my maybe list. 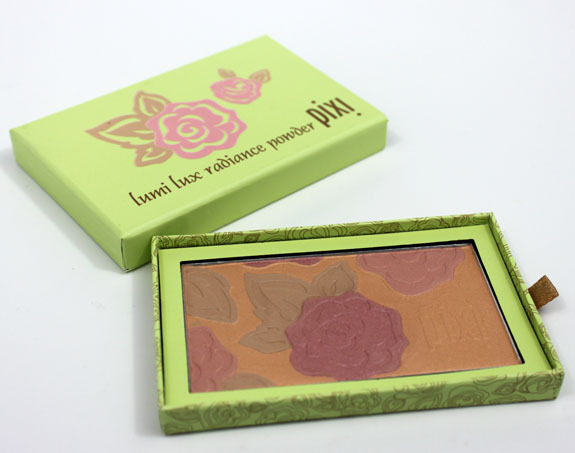 I really like the flower design of the powder, and I never fall for things like that! I like this, but I don’t think I would use it enough to pay $26 for it, no matter where it’s from. I know it’s just a mental block, but it’s hard to get over paying that much for something from Target, too! I have this, but haven’t gotten a chance yet to try it out. The floral design is so pretty! Your photography skills continue to impress me. It’s cute and looks nice, but a no-go for me at the price. 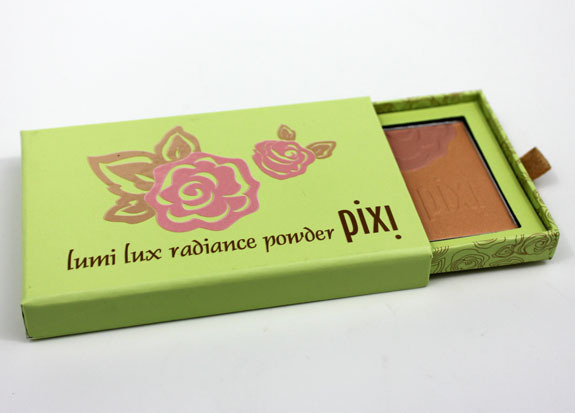 I think Pixi products are overpriced for their quality. It’s ridiculous that some of these “drugstore” products cost as much as high end products. borrricua´s last post…¡¡UNDA DA SEA!! Cute box and pretty pattern of the powder. Expensive for Target. Being a pretty pale gal, I actually don’t mind the subtlety of the color, but I feel I have enough similar items in my collection that I don’t necessarily ‘need’ this. Very pretty though, I have a weakness for products that have these sort of embossed designs. It makes for a very interesting subtle glow. Not enough oomph for me with this which is too bad because it LOOKS really cool with the design and all. I’ve got the one that looks like fairies and I love it, I’ve nearly ran out. I think I bought mine from Ebay though because I thought it was just a bit too pricey.